V3D enables real-time 3D visualization and quantitative analysis of large-scale biological image data sets. Peng H, Ruan Z, Long F, Simpson JH, Myers EW. Nat Biotechnol. 2010 Mar 14. Demonstrate V3D and explain its capabilities and purpose. How are V3D and Chimera related? What can we learn from V3D? 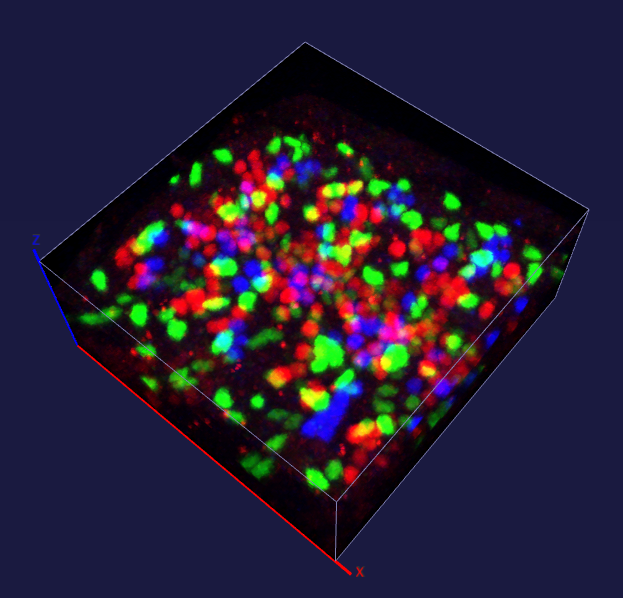 The V3D system provides three-dimensional (3D) visualization of gigabyte-sized microscopy image stacks in real time on current laptops and desktops. 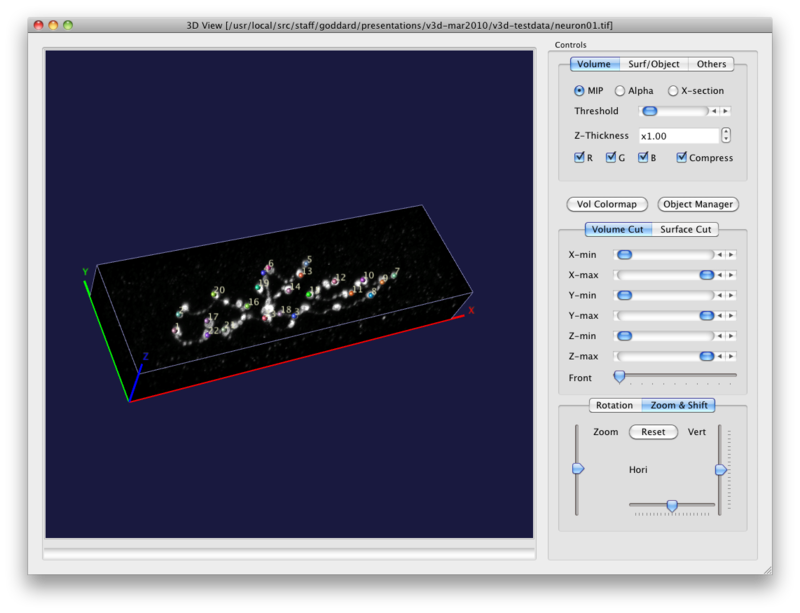 V3D streamlines the online analysis, measurement and proofreading of complicated image patterns by combining ergonomic functions for selecting a location in an image directly in 3D space and for displaying biological measurements, such as from fluorescent probes, using the overlaid surface objects. V3D runs on all major computer platforms and can be enhanced by software plug-ins to address specific biological problems. To demonstrate this extensibility, we built a V3D-based application, V3D-Neuron, to reconstruct complex 3D neuronal structures from high-resolution brain images. V3D-Neuron can precisely digitize the morphology of a single neuron in a fruitfly brain in minutes, with about a 17-fold improvement in reliability and tenfold savings in time compared with other neuron reconstruction tools. Using V3D-Neuron, we demonstrate the feasibility of building a 3D digital atlas of neurite tracts in the fruitfly brain. More details on V3D web page. 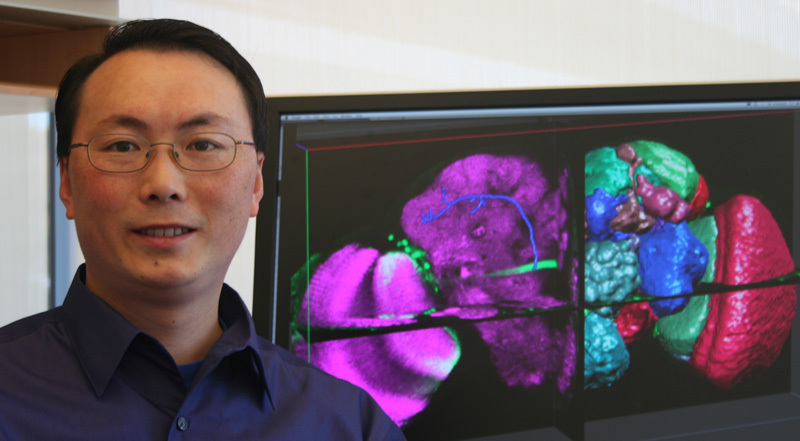 V3D developed by Hanchuan Peng who heads a 6-member lab at Janelia Farm Research Campus of the Howard Hughes Medical Institute. 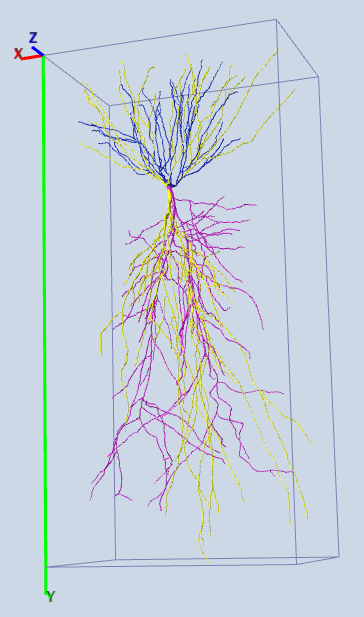 Main biology focus appears to be making neuron wiring atlas of fruit fly. Hanchuan Peng interested in bioimage informatics, digital image atlases for model arganisms. Conferences he chaired. Program developed by Hanchuan Peng since 2006. Current version 2.452 (March 17, 2010). Demonstrate tracing neurons by marking tips and having V3D connect. This is a specialized segmentation tool that combines manual steps (marking tips) and automated steps (joining markers). Similar to Segger. "Tri-view" window shows 3 orthogonal 2-d slices. 3D view window shows volumetric rendering plus markers and surfaces. Images I made from test data sets. Fly embryo, confocal microscopy with 3 different transcriptional factors fluorescently labeled. All applications shown are to 3-d light microscopy data (confocal, SPIM), fluorescently labeled, examples with up to 3 or 4 different labels. Often refers to 4D data meaning 3 spatial dimensions plus multiple (2, 3 or 4) light wavelengths which is the 4th dimension. Sometimes refers to 5D data where the 5th dimension is time, e.g. 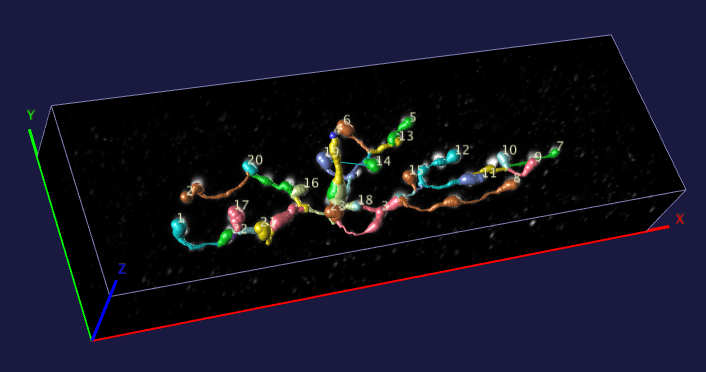 having 120 time points for live C elegans imaging. Fast volume rendering of 3 Gbytes volume data sets at full resolution (8 frames / sec, GeForce GTX 280, 64-bit Redhat Linux). Interactive marker placement with mouse (on max intensity, or two clicks from different view directions). Types of models: Displays volume data, surfaces, markers (as spheres) and 3-d graphs (vertices and edges) used for neuron skeletons. 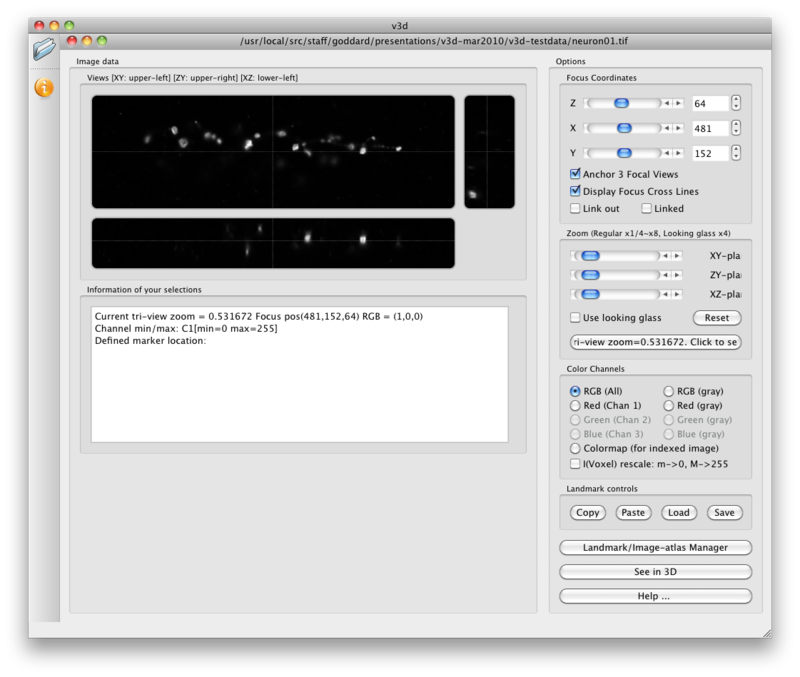 Unique feature: Semi-automatic neuron tracing using the included V3D-Neuron plug-in. Has "local" and "global" views -- i.e. subregion bricks can be displayed at the same time as the entire data in a separate window. Can select subregion by drawing polygon (dim red) in tri-view slices to define "Region Of Interest (ROI)". Then use "See in 3D" button to show in separate window. Intersects polygon projections in 3 orthogonal views. Menu Image/Data -> intensity -> clear ROI to make new region. V3D can display masks as contour surfaces -- it calls this a "label field surface". From the web page: "has a Matlab file IO toolbox". Defines comma separated values (CSV) file formats for markers and traced neurons. Wavefront OBJ or it's own custom format for surfaces. Many undocumented data filtering / masking operations in tri-view window top-of-screen menu (on Mac). Nothing for molecule visualization since all data shown is light microscopy. Volume rendering speed was same as Chimera with neuron test data. Good neuron segmentation algorithm is the stand-out distinct feature or V3D. Uses Qt and distributed on Windows, Mac, Linux. Mac 64-bit installer download was 13 Mbytes. Linux was only 2 Mbytes (didnt' include Qt libraries). Distribution is an executable and 8 plug-in shared libraries. V3D uses 2d textures for volume rendering by default. Uses texture compression but says it can make blocky images. Downloaded plugin source code examples. 8 examples. Each plugin consists of 200 - 1000 lines of C++ code, including Qt for user interface. Web page says there are more that 30 plug-in modules that will be released soon. Full source code not available on web. May be available by request. "In V3D, indeed most functions are obvious ... thus I did not document them in details. You can find a simplified (indeed unfinished) User Manual below." User manual (34 pages, May 2009) -- many illustrative pictures. editing/changing any portion of codes in this package. extent of documentation and comments present. as a user, and do not leave insulting message in the [online] registration form.